The beginning of the long and extended holiday season is upon us and I am trying to get in the “spirit.” Halloween is next week and so begins the holiday kick-off season with a few spook-tacular events. Target is already airing their Christmas commercials on TV and, before you know it, we’ll be ringing in the new year. But let’s not skip a beat–we need to get everything we can out of the pumpkins before moving on to warm and comforting soups, tart cranberries, rich and locally grown pecans and slow cooked meats, beans and stews. Last week, I roasted our first sugar pie pumpkin of the year and even roasted the seeds. This 4-lb. pumpkin gave me seven (7) cups of pumpkin puree which should last us a while. This is the impetus I need to try out a few new recipes since I’m in the mood for a different pumpkin holiday dessert. Over the last few years, I have enjoyed making desserts that are gluten-free, grain-free and even sugar-free so that I can enjoy them and share them with my friends and family who are also on the (gluten/grain/sugar) “free” bandwagon. Made with just a few key ingredients like pumpkin puree and cream along with plenty of seasonal spices, who wouldn’t like to sample a little pumpkin custard? It might be just what everyone needs to get a jump on the holidays. If you love pumpkin pie, but are trying to minimize your love affair with crust, this recipe is your new best friend. Be sure and taste the custard--adding a bit more nutmeg or cinnamon if you like. Light on sugar and heavy on flavor, this is a gluten-free, grain-free dessert you will love! It could easily be made sugar-free. In a large bowl (one that you can use as a double boiler), whisk the pumpkin, beaten egg yolks, heavy cream, sugar, spices and vanilla until well combined. In a sauce pan, bring about 2 inches of water to a boil and place the bowl on top, stirring the custard continuously until thick enough to coat the back of a spoon. Pour the thickened custard into a baking dish and bake at 350 degrees F for about 30-40 minutes or until a toothpick inserted into the custard's center comes out clean. 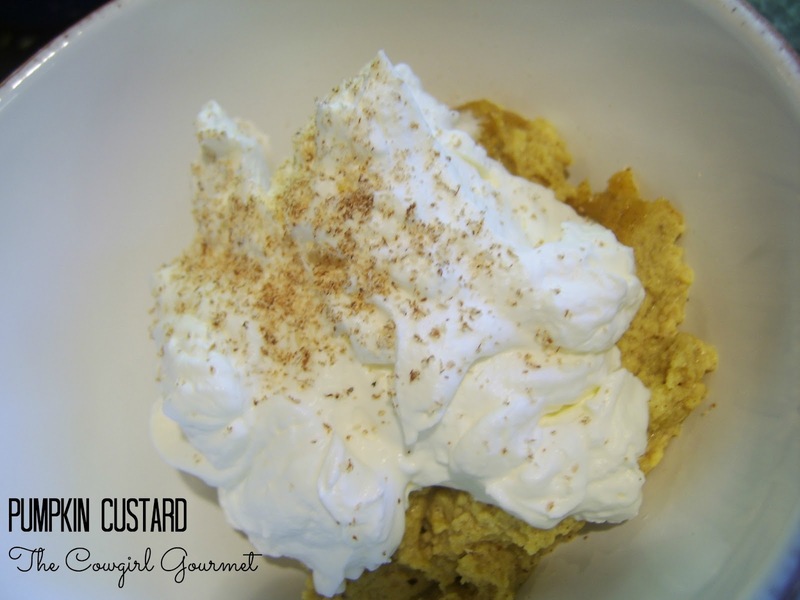 Serve warm or at room temperature with a few generous spoonfuls of whipped cream and a dash of freshly ground nutmeg.